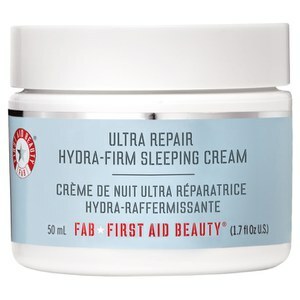 First Aid Beauty's Ultra Repair Hydra Firm Overnight Sleeping Cream moisturises for smoother appearing, hydrated skin. 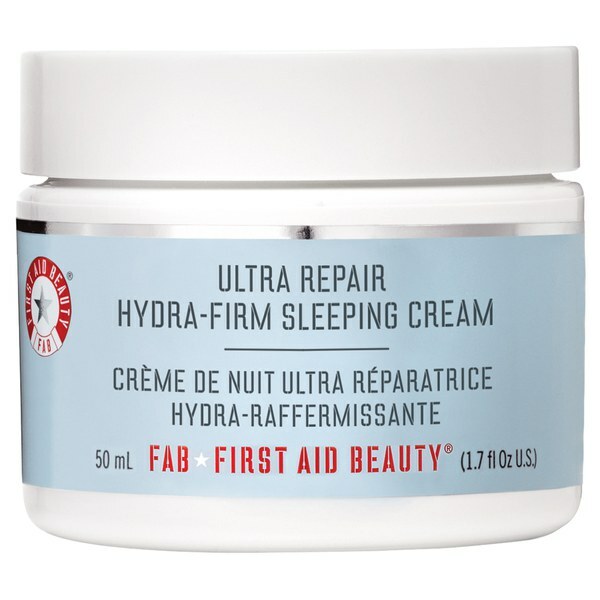 Sleep your way to a more youthful-looking complexion. This super-charged blend visibly combats the appearance of key signs of ageing during the skin's nightly repair phase. The unique formula includes a powerful peptide blend to help smooth the appearance of fine lines and wrinkles, Glutaline-In-Tense to improve the appearance of skin's firmness, and niacinamide to help skin appear more bouncy and healthy in tone and texture. Sodium hyaluronate, colloidal oatmeal, and conditioning butters and waxes hydrate for healthy-looking skin. This weightless, buttery cream seamlessly envelops skin and moisturises throughout the night. Appropriate for all skin types - even the most sensitive skin - apply nightly before bedtime to wake up to a moisturised complexion with a firmer and smoother appearance. 90% reported skin appeared softer, smoother, and more supple after 4 weeks of continued use. Apply nightly to clean, dry skin. May be used alone or over your favourite serum. Water/Aqua/Eau, Glycerin, Caprylic/Capric Triglyceride, Butyrospermum Parkii (Shea) Butter, Dimethicone, Glyceryl Stearate, C10-18 Triglycerides, Ethylhexyl Palmitate, Lactobacillus Ferment, Jojoba Esters, Cetyl Alcohol, Niacinamide, Spilanthes Acmella Flower Extract, Helianthus Annuus (Sunflower) Seed Wax, Acacia Decurrens Flower Wax, Algae Extract, Palmitoyl Tripeptide-38, Sodium Hyaluronate, Avena Sativa (Oat) Kernel Flour, Palmitoyl Hexapeptide-12, Palmitoyl Tetrapeptide-7, Camellia Sinensis Leaf Extract, Chrysanthemum Parthenium (Feverfew) Extract, Glycyrrhiza Glabra (Licorice) Root Extract, Hydroxypropyl Cyclodextrin, Sodium Lactate, Butylene Glycol, PEG-75 Stearate, Acrylates/C10-30 Alkyl Acrylate Crosspolymer, Ceteth-20, Steareth-20, Polyglycerin-3, Carbomer, Polysorbate 20, Phenoxyethanol, Xanthan Gum, Tetrasodium EDTA, Sodium Hydroxide.